Today’s guest author is Dr. Scott Loarie, a fellow at the Carnegie Institution for Science at Stanford and co-director of iNaturalist.org, a biodiversity citizen-science website. 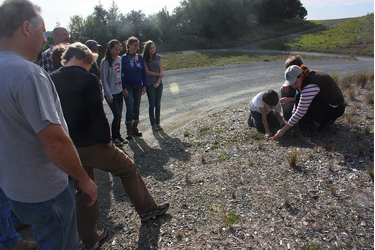 Pepperwood Preserve was the recipient of a Google Earth Outreach Developer Grant, funded through the Google Inc. Charitable Giving Fund at the Tides Foundation. 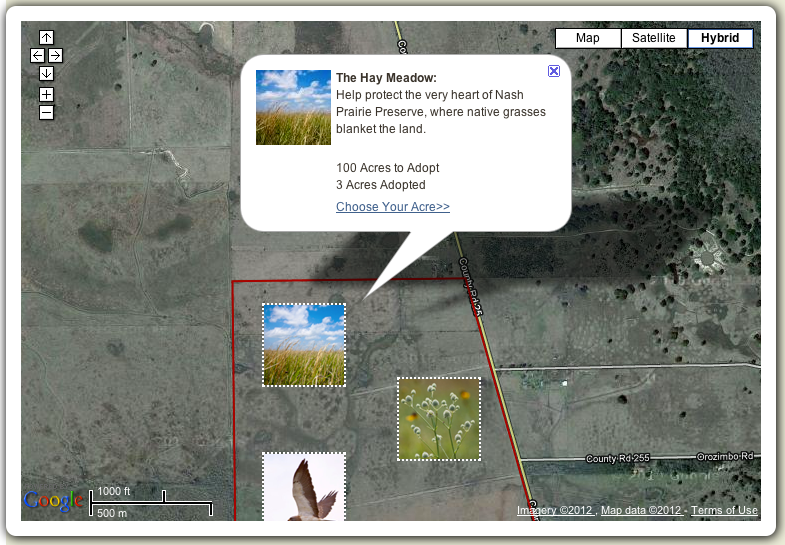 We’re excited to share how the iNaturalist Android application developed as a result of this grant is being used in action at Pepperwood Preserve. 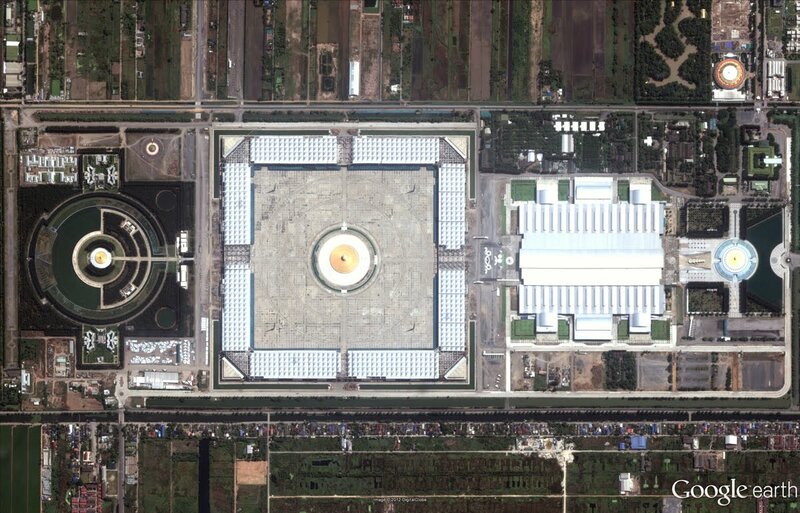 and Maps Imagery team recently published another batch of satellite imagery. In this post, we’ll explore a few well-known locations from across the globe. Our first example is the Bristol Motor Speedway, located outside of Bristol, Tennessee. 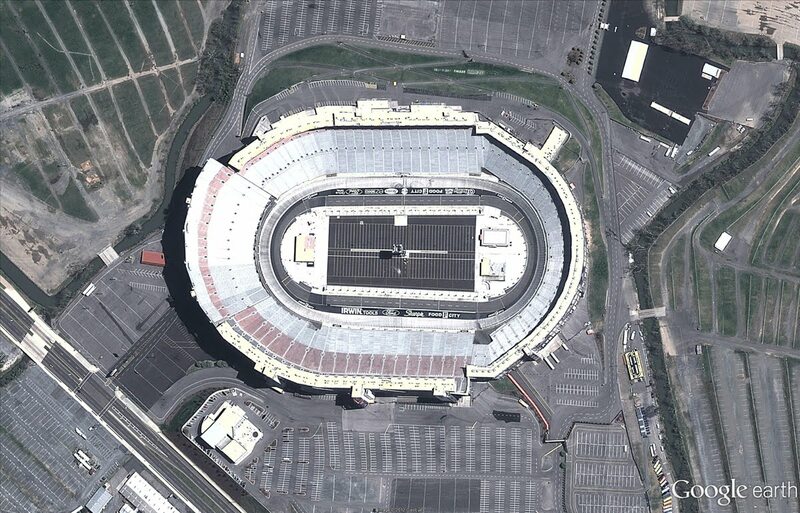 This NASCAR short track speedway is the 8th largest sports venue in the world, and hosts up to 165,000 people. If you think the typical NASCAR race is too crowded, how about visiting a location with a few million others on a single day? That’s the estimated crowd size expected each year to the Kaba (shown below), in Mecca, Saudi Arabia, on the day of the annual Islamic pilgrimage Hajj. 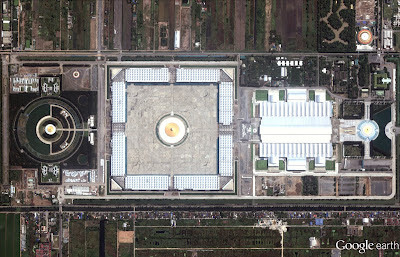 Another great place to visit - either virtually or in person - is the Grand Mediation Amphitheatre located in the World Dhammakaya Centre in Pathum Thani Province, Thailand. As shown below, the Centre provides a place where anyone is welcome to meditate. If you prefer to spend your leisure time contemplating classic literature, you’ll enjoy this final example from Spain’s central La Mancha region. This perspective view highlights the vineyards and arid plateaus that form the backdrop of The Ingenious Gentleman Don Quixote of La Mancha. If you’d like to receive an email notification when the Google Earth and Maps Imagery team updates your favorite areas(s), we’ve got just the tool: The Follow Your World application! These are only a few examples of the sites that can be seen and discovered in our latest batch of published imagery. Happy exploring! Albania, Algeria, Angola, Antarctica, Argentina, Armenia, Australia, Austria, Azerbaijan, Bangladesh, Belarus, Belize, Benin, Bermuda, Bolivia, Bosnia and Herzegovina, Botswana, Brazil, Bulgaria, Burkina Faso, Burundi, Cambodia, Cameroon, Canada, Cape Verde, Central African Republic, Chad, Chile, China, Colombia, Costa Rica, Croatia, Cuba, Cyprus, Czech Republic, Democratic Republic of the Congo, Djibouti, Dominican Republic, Ecuador, Egypt, El Salvador, Eritrea, Estonia, Ethiopia, Fiji, Finland, France, Gabon, Georgia, Germany, Ghana, Gibraltar, Greece, Greenland, Grenada, Guatemala, Guinea, Guinea-Bissau, Haiti, Honduras, Hungary, India, Indonesia, Iran, Ireland, Israel, Italy, Japan, Jordan, Kazakhstan, Kenya, Kuwait, Kyrgyzstan, Laos, Lebanon, Lesotho, Liberia, Libya, Lithuania, Macedonia, Madagascar, Malawi, Mali, Marshall Islands, Mauritania, Mayotte, Mexico, Moldova, Mongolia, Morocco, Mozambique, Myanmar, Namibia, Nepal, Netherlands, New Zealand, Nicaragua, Niger, Nigeria, North Korea, Norway, Oman, Pakistan, Panama, Papua New Guinea, Paraguay, People's Republic of the Congo, Peru, Philippines, Poland, Portugal, Qatar, Romania, Russia, Rwanda, Saudi Arabia, Senegal, Serbia, Slovakia, Slovenia, Somalia, South Africa, South Korea, Spain, Sri Lanka, Sudan, Suriname, Svalbard, Swaziland, Sweden, Switzerland, Syria, Taiwan, Tajikistan, Tanzania, Thailand, The Bahamas, The Gambia, Timor-Leste, Tunisia, Turkey, Turkmenistan, Uganda, Ukraine, United Arab Emirates, United Kingdom, United States, Uruguay, Uzbekistan, Venezuela, Vietnam, Western Sahara, Yemen, Zambia, Zimbabwe. These updates are now available in both Google Maps and Google Earth. For a complete picture of where we updated imagery, download this KML for viewing in Google Earth. 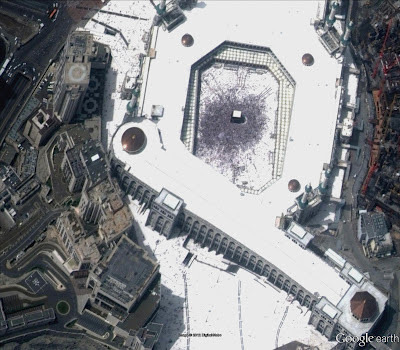 The Google Earth and Maps Imagery team recently published another batch of satellite imagery. In this post, we’ll explore a few well-known locations from across the globe. once said, “The journey of a thousand miles begins with a single step.” In Google Earth, that single step is often searching for the name of the place you want to go. The search field is the gateway to all of the amazing places you might visit, and for the recent release of Google Earth 6.2, we worked hard to make it even more powerful and easy to use. As a result, searching for a location in Google Earth 6.2 is a bit different: we’ve streamlined the look and feel of the search interface, removing tabs and consolidating all the search fields together into one (just like Google Search). 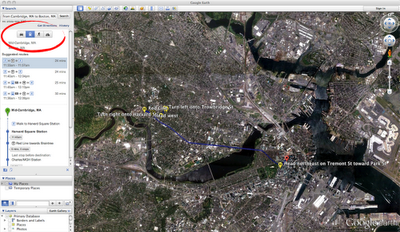 We’ve also added features that Google Earth previously didn’t have, like transit directions and search layers. And we’ve made sure that underneath these shiny new features, you still have access to the power and flexibility of KML. If you live in one of the many metropolitan areas supported by Google Transit, you’ve probably used the transit directions search on Google Maps to plan a trip. Now you can do the same thing in 3D with Google Earth. Select “Get Directions” and enter your endpoints, then choose the train icon at the top of the search results for public route instructions. You can also click on any of the transit stations or stops to fly there. Be sure to turn on 3D buildings - some train stations are really quite pretty! You’ll also notice icons for walking and biking directions, so if you’ve ever wanted to go on a virtual tour of your next cycling excursion, or find out just how steep that hill is before you commit to the journey, now you can. Search layers were first introduced in Google Maps a few years ago, and at last, they’ve recently made their way to Google Earth. Search layers enable you to see all the results of your search on the map at once, not just the top ten, making it easy to find clusters of certain types of businesses like fast food restaurants or coffee shops. One of the more entertaining uses of search layers that I’ve found has to do with a road that will be familiar to anyone who’s visited California: El Camino Real. Stretching from Sonoma Valley to San Diego, El Camino is a great place to find shops and restaurants of all kinds - and lots of them! Here’s a search layer for all the pizza places in the San Francisco Bay area; can you spot El Camino? 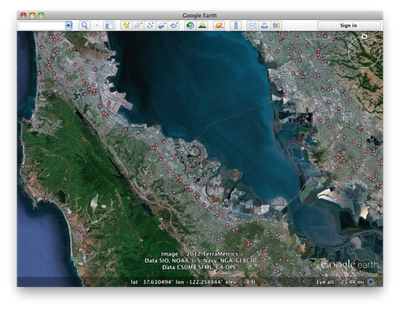 Search in Google Earth is much more than a pretty face, though. Just beneath the surface lies the powerful KML language, which you can use to take full control of your searches. Right-click on any search listing to save it to My Places or copy it as KML text, or click one of the icons below the search results to save or copy everything all at once. Save your walking directions to My Places and start a tour of the route to get turn-by-turn directions from the comfort of your chair. You can also click on “History” below the search field to see all of your recent searches at once, and selectively hide and show results to get, say, a picture of the top ten hotels and crêpe restaurants in Paris, for optimal crêpe-eating efficiency. We’ll continue to improve the search experience in Google Earth, so stay tuned, and keep those searches coming! Lao-tzu once said, “The journey of a thousand miles begins with a single step.” In Google Earth, that single step is often searching for the name of the place you want to go. The search field is the gateway to all of the amazing places you might visit, and for the recent release of Google Earth 6.2, we worked hard to make it even more powerful and easy to use. is a Google Maps API powered application that enables users to share the stories and locations of their most memorable smooches. Creator Chris Kay Fraser teaches creative writing and moonlights as an independent Maps API developer. She views this clever use of the Google Maps API as an opportunity for Canadians to share their romantic tales. All entries are anonymous and must be 500 characters or less. Check it out for yourself, and Happy Valentine’s Day to all our users - in Canada and around the world! First kisses, last kisses and all those kisses in between... here’s your chance to kiss and tell! Just in time for Valentine’s Day, the Canada Kiss Map is a Google Maps API powered application that enables users to share the stories and locations of their most memorable smooches. to look up the same places and directions more than once, like the location of your hotel while you’re on vacation, or directions to a friend’s house that you’ve visited before. When you’re signed in to your Google account, the My Places tab on Google Maps makes it easy to find starred locations, places you’ve rated and checked-in, saved Custom Maps, and even past local searches. 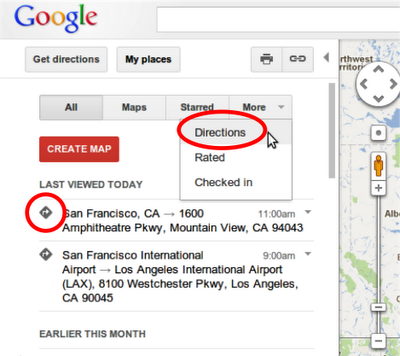 Now, when you visit My Places, you’ll see directions you’ve recently looked up appear on the panel to the left of the map. You can also filter the results to access only these previous directions from the ‘More’ tab. This historical archive of directions results makes it quicker and easier to continue planning later. For example, if you have a few minutes to spare during the day and use your work computer to search for directions from your house to the restaurant where you’re meeting friends for dinner, you can easily access those same directions from your home computer via My Places once you’re ready to head out. We’ll even remember when you’ve customized your directions by dragging the blue line to your preferred path, and show that you route again. These past directions and places will only appear for signed-in users who enable Web History. And like other items in My Places, it’s simple to remove any of the locations or directions via the drop-down arrow next to each item. Whenever you need to access or organize your important places and directions, just visit Google Maps and click on the My Places button to get started. Update (2/15): Sorry for the delay, but the new feature for viewing saved directions in My Places will be available soon. We'll update this post again when the feature is live. 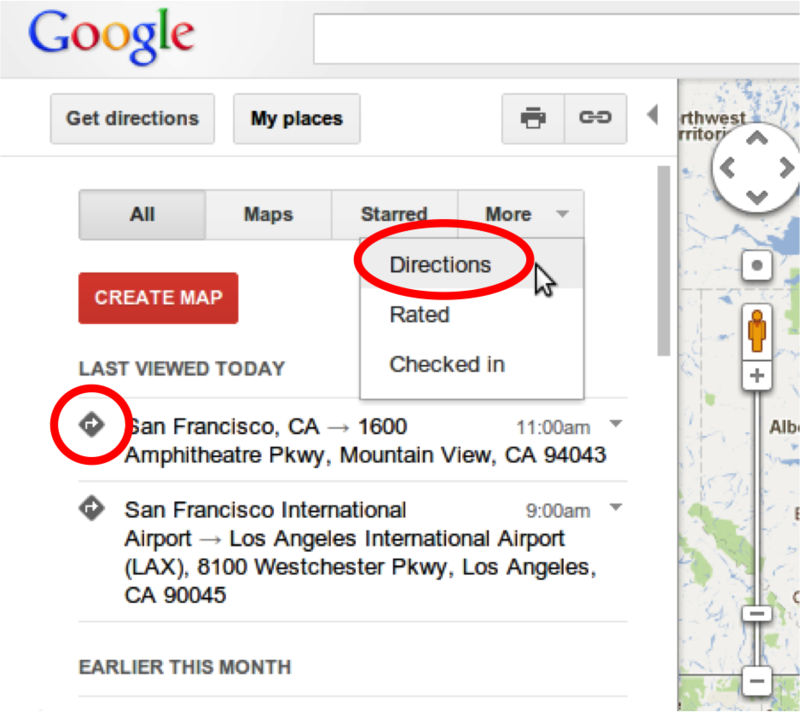 Update (2/18): The feature is now live on Google Maps. Thank you for your patience! If you’re anything like me, you might use Google Maps to look up the same places and directions more than once, like the location of your hotel while you’re on vacation, or directions to a friend’s house that you’ve visited before. When you’re signed in to your Google account, the My Places tab on Google Maps makes it easy to find starred locations, places you’ve rated and checked-in, saved Custom Maps, and even past local searches.
. Today we’re kicking off the first ever Map your University 2012 competition for the United States and Canada! From February 13th until March 9th, 2012, Google invites students studying in the United States and Canada to become local experts by updating and adding detail to their campus maps for viewing in Google Maps and Google Earth. Adding everything from walking paths to university buildings to local businesses will help students and visitors alike when trekking across your college grounds. Winning teams will be selected based on the thoroughness and accuracy of mapping in and around campus, and a brief personal statement. Fabulous prizes include Android tablets and phones, GPS devices, Google Map Maker messenger bags, t-shirts, and more! 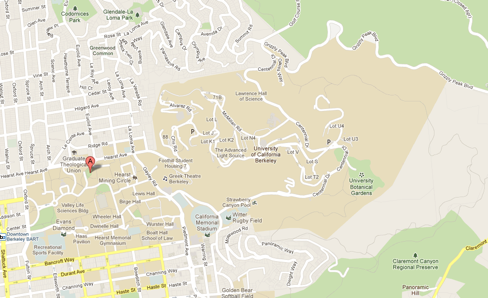 The beautifully mapped University of California Berkeley Campus, completed by participants in the 2011 US Map Maker Roadshow. Many university students around the world are already hard at work mapping their schools. UC Berkeley, pictured above, was among 18 universities that participated in the 2011 US Map Maker Roadshow, as was Lehman College, where students mapped almost their entire campus in one day! Over 700 attendees across the country participated in hands-on mapping workshops and mini-competitions with the help of Google’s Student Ambassador Program. Now it’s your chance to make your university shine for all the world to see on Google Maps and Google Earth. For more information about how this powerful tool works, rules and registration, be sure to visit the contest homepage. The winning team will be announced in early April. Good luck, and happy mapping! Have you ever wished you knew the most direct route from your dormitory to your geography class across campus? Do you want a great way to help your roommate finally discover the library before midterms? Now is the perfect time to form a team and ensure that your university map is up to date using Google Map Maker. Today we’re kicking off the first ever Map your University 2012 competition for the United States and Canada! A few months ago we shared an engagement story about a Google engineer who used Google Maps to help coordinate an elaborate proposal to his girlfriend. It served as a great example of how Google Maps can be more than just a handy tool for directions; it can help connect you to the places and people you love. With Valentine’s Day right around the corner, we were once again reminded of the unifying power of maps through our ongoing work with one of America’s most famous malls, Mall of America in Bloomington, Minnesota. We recently collaborated with Mall of America to conveniently bring its indoor floor plans and My Location information to Android mobile users. As the largest indoor retail space in the United States—complete with a theme park and aquarium—finding your way around Mall of America can be challenging. 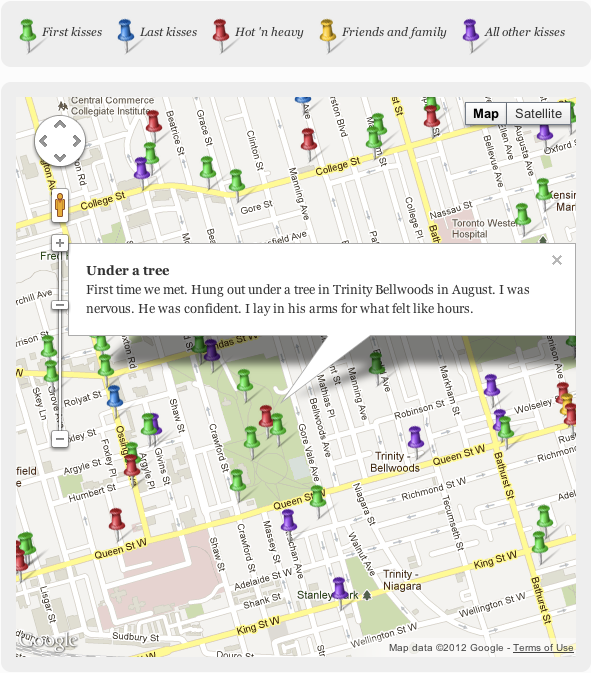 So we mapped it, enabling you to quickly and easily see where you are and what’s around you from the palm of your hand. to explore exotic islands, re-visit their childhood homes, and scout out day hikes. Are you one of them? If so, why not share your virtual travel with friends and family? We’ve already seen fantastic Google Earth land and cityscapes shared on Google+, not to mention solar systems, ocean topography, Street View scenes, weather forecasts, gigapixel photography and more. If you can find it in Google Earth, you can share it on Google+. With Google Earth 6.2, you can easily share your Google Earth adventures on Google+. 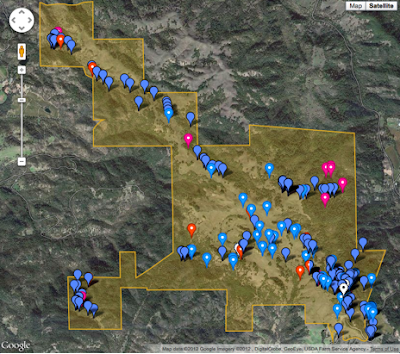 And if you’re looking to engage with like-minded cartographers, add the new Google Earth +Page to your Google+ circles and share your own Google Earth snapshots with us. Use the hashtag #GoogleEarthSnapshot in your image description and we could include your photo in a community album on Google+! There’s a world full of geo enthusiasts out there, so check our Google+ page often to share in the exploration. Millions of people use Google Earth to explore exotic islands, re-visit their childhood homes, and scout out day hikes. Are you one of them? If so, why not share your virtual travel with friends and family? Heidelberg is a university town in southwestern Germany, located at the Neckar river. A former residence of the Electoral Palatinate, Heidelberg is popular among travellers for its historic city center and castle ruins of red sandstone in a mix of architectural styles. Having been around for more than 600 years, the University of Heidelberg is one of Europe’s oldest institutions of higher education. San Sebastián (Donostia in Basque) is a Spanish town located on the northern Iberian Peninsula along a bay that’s shaped like a seashell. The San Sebastián International Film Festival has given the town international renown. Carmel-by-the-Sea, situated along Highway 1 in California’s Monterey County, is famous for the Spanish Mission founded there in 1770. Its mild climate and the variety of nature and wildlife that can be experienced on the famous 17-Mile Drive around Monterey Peninsula make it popular among artists and tourists alike. Located along the estuaries of the RÍo de la Plata, Buenos Aires is the largest city in Argentina and the second largest metropolitan area in all of South America. Founded in 1536, the city is recognized for its eclectic Italian and Spanish-influenced architecture and rich cultural life. Have fun exploring the new sites! Our February update of 45° aerials contains imagery of 15 U.S. and 7 international locations in Google Maps. More than two-thirds of Earth is covered by oceans. If you drained all of that water away, you'd see huge basins that have never been explored, an undiscovered planet in our own backyard. Today is the three year anniversary of an explorable ocean seafloor in Google Earth. We just released a major update to our global underwater terrain dataset, called bathymetry, from the Scripps Institution of Oceanography, in partnership with NOAA, the US Navy, NGA, and GEBCO (with major contributions from IFREMER and IBCAO). The update covers ocean topography from all over the globe and reveals our most accurate view of the seafloor to date. This new detail comes from spacecraft measurements of bumps and dips in the ocean surface as well as shipboard soundings from surveys carried out by over 40 countries. With this update to ocean terrain data in Google Earth, 15 percent of the seafloor is now available at 1 km resolution. You may remember a Sun article reporting the discovery of a street grid where it’s believed the lost city of Atlantis would have been located off the West Coast of Africa. The discovery turned out to be a data artifact related to the way data was collected from a ship sailing back and forth to survey an unknown area. This recent seafloor update has been improved to blend better, and “Atlantis” has again disappeared into legend. Previous terrain data showed what appeared to be a city grid on the ocean floor (left), which was confused for the lost city of Atlantis. Updated data more accurately reflects the seafloor terrain (right). Another place you’ll notice an improvement in the ocean terrain data is the Mediterranean Sea, particularly south of Cyprus, where the boundary between the Eurasian and Arabian plates is now more clearly defined. Our last example shows improvements to the land-sea mask along the coastline of Guam. You’ll notice a dramatic improvement in the resolution of both the coastline and neighboring Mariana’s Trench, the deepest trench in the world. In order to make this update possible, our partners at the Scripps Institution of Oceanography at UCSD have curated 30 years of data from more than 8,000 ship cruises and 135 different institutions. If you’d like to get a closer look at these changes, watch our video tour of this new terrain. We hope you enjoy diving deeper than ever in Google Earth!